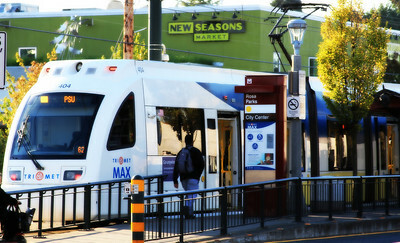 There are a number of people types when it comes to light rail in Portland. I’ve set out to put together a view of those types. First off, I’ll describe the two types I find myself fitting into. “Backbone Advocates” – Ideal: Light Rail is a great arterial back bone for a transit system. These advocates see light rail as a great core service provider for moderate to heavy use lines. They’re often likely to want light rail (LRT) over bus rapid transit (BRT) in almost every scenario. The key reason, is because growth can congregate around light rail far better than almost every other bus option. A backbone advocate is also dramatically less likely to use a bus over or in lieu of light rail. 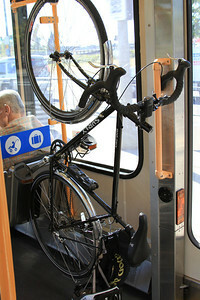 “Cycling Transit Advocates” – Ideal: Light Rail are useful, buses are a pain, I’d rather just bike. Ok, this category I fall into a lot. Buses are effectively useless and dangerous to cyclists. 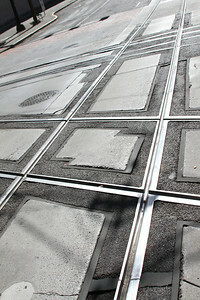 More so than the tracks in the street. Buses have been the vehicles that have killed almost a dozen of cyclists over the last decade. Many of them children, 5-12 years old. Beyond that, the bus carries two cycles at the most. None of the bus drivers barely know a thing about placing cycles on board. So effectively a bus carries 2 cycles, light rail – a one car train – can carry 4 on racks, and almost a total of 4-6 in between the entrances in the open area for a grand total of 8-10 per car. Most light rail runs with 2 cars, giving a total of 16-20 bikes per train. Buses can’t even remotely touch this. The last fact is simple – streetcars and light rail don’t merge onto you when you’re biking. That makes the rail based streetcar or light rail option the only real transit option for cyclists. 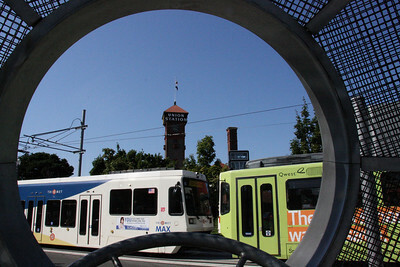 “Derp Advocates” – Ideal: Light rail is nifty, I like the way it looks. These advocates love light rail. They’re not sure they know why they like light rail, but they like it. They like how it feels and they feel X, Y or Z about it but usually can’t back up any of those reasons. These are the people that vote for light rail, and want it because it’s green or it looks pretty or some other non-functional, not really true reason to want light rail, but they love it anyway. These advocates are useful for their votes for light rail, but politically they’re as detrimental to light rail as any other thing someone may advocate for. Basically these advocates are the urbanized version of a dumb red neck that thinks the highways are part of the free-market. “Numbers Advocate” – Ideal: I can statistically prove why light rail is the superior option. These advocates don’t care about passion or how one feels about something, they’re here to prove everybody else wrong and those that oppose light rail just can’t do simple math. They’re often harsh and introverted to the extreme. These advocates are huge political help when light rail comes up against the “it’s too expensive” or “it doesn’t carry enough people” or whatever other nonsense someone comes up with. These advocates are the ones who do analysis on every single thing they can find. Very useful for bringing up the argument of what light rail really does for a city, but not someone to advocate in front of the camera. “Car Hater Advocate” – Ideal: It aint a car, build it. End of story. This advocate is simple. Sometimes a cyclist, sometimes a curmudgeon, or whatever they may be they are against anything car related. They often have a host of reasons, all very legitimate, but something society just can’t face no matter how true they are. This advocate doesn’t care how expensive a line gets, doesn’t care if it messes up existing traffic, and only cares about getting the line built. These advocates are politically damaging but often bring with them a number of other staunch advocates in the above categories. “Common (Wo)Man Advocates” – Ideal: I’ve analyzed what data I could find, looked at the benefits and negatives and this seems like a great option. These advocates are the most important, politically and for ridership reasons. They are the people who will be the core ridership of the line and also will make a line politically feasible or not by discussing and carrying on conversation to build political momentum for a line. They may come to community meetings, they may not, but they’ll be talking about light rail at coffee shops, in the office, over the water cooler and anywhere else the topic comes up. They’ll talk about the pros and cons of the line and say they lean toward building light rail and riding light rail. “I Hate Traffic Light Rail Advocate” – Ideal: If they build other stuff for other people to ride on then I won’t have to deal with as much traffic when I drive. This is the hypocrite, yet very important ally in the battle to get light rail transit systems built. These advocates, albeit horribly misguided in their notions of what does or doesn’t create traffic, are key in winning votes to get light rail built. Even with the facts around human behavior and induced demand, these advocates have some odd idea that transit will resolve the idiocy and failure of auto dependent roadways. I find myself in the first category, mostly, except for the part about “wanting to see light rail over bus (including BRT) in every situation”. In general, my preference is informed by the budget and desired characterists of the route. If a route is going to be fully separated from traffic; particularly if it is going to be grade-separated for significant distances, I tend to prefer rail. If, on the other hand, there will be some street-running parts, and little new right-of-way (OR if we are going to turn auto lanes into bus lanes, and only need to apply paint), then BRT is a much more attractive choice. I personally don’t worry so much about development around stations or stops. But yeah, I’m on board with that. I worry about development, as that’s key to sustaining the lines a lot of the time. Thanks for the comment Scotty!